Extensive written tests and Question and Answer Period before Practical Training starts. 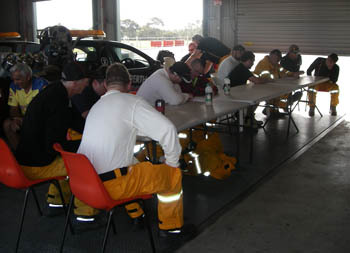 Emergency Response Safety training commenced on Sunday, 23rd of September with our Fire & Safety Crew who undertook our Annual extensive training seminar for Speedway, Drag Racing & Burnout events at the Perth Motorplex. To make aware of crew duties and responsibilities. To ensure that crew possess the skill of Fire & Rescue and to perform with Competency. To promote and secure health, safety and welfare of Crew. To assist in securing a safe work environment. To reduce, eliminate and control hazards to which the Crew are exposed at work. To promote education awareness on matters relating to Fire & Rescue. Various hands on Training using some of the specialised equipment. The Emergency Response team members conducted the ‘hands on’ practice using a variety of functions with several jaws of live and spreaders. The crew performed several scenarios extracting smashed vehicles and all carry out competently also the use of the Robinson tool – known as the Hooligan tool and Glasscutter for cutting windscreens. 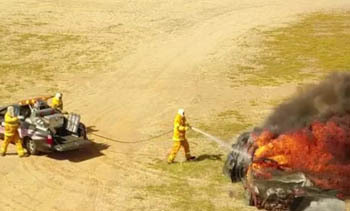 Actual fire fighting technics related to vehicle fires are simulated. The Emergency Response Team members and Track Safety personnel’s conducted several fire simulations using state of the art training equipment, with several vehicles fire scenarios. Perth Motorplex would like to thank all our Attendees, Trainers and Team members for giving up their time with their dedication to safety. All performed competently as they continue to lift the bar is Safety for the 2018-2019 Perth Motorplex season.